These 2 Caucasians are siblings and were originally brought into the country from Hungary. They are now aged 4 years old and have lived in suburbia in a purpose built kennels. The girl Sox is much smaller than her brother Pitsi. Both dogs were let out from the kennels and able to roam free from the back to the front garden where they immediately came to the window to say hello to their owners. When they saw the volunteer there was a quick grumble from Sox but nothing too intimidating. The owner put both dogs on the lead and surprisingly for the size of these dogs they were very well behaved. They waited patiently to cross a fairly busy main road, walked gently by his side through the suburban streets and when near a piece of grassland, both dogs sat patiently whilst he took their leads off and gave the command to go free. It is without a doubt that this pair will need a responsible new home, especially as both dogs are un-neutered (currently live in separate kennels) and will need an owner with presence who can command top dog status. They would also benefit from a rural home with land somewhere they can roam free. We are told they are not used to socialising with other dogs just walked as a pair together (having said that owners do take them to public parks). Caucasians are not the breed for everyone so new owners need to research the breed before considering applying to adopt these dogs. 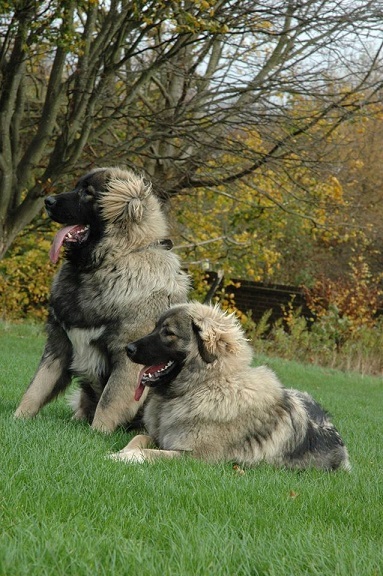 Further information on Caucasian Shepherds.